It takes a fine touch to cut glass, but Pyramid Pensacola students were up to the task when they went for their first stained glass lessons at artist Joy Sims studio, Joy of Glass. 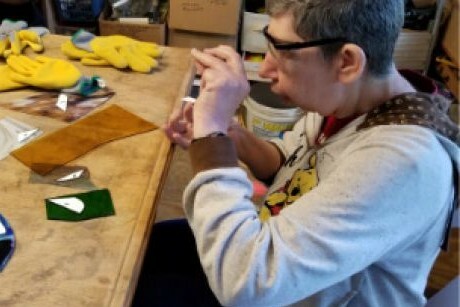 Students Betty Wells, Catherine Gooden, Mindy Cooper and Matthew Kelley started their lessons this week and began by choosing patterns and glass color for suncatchers and learning to safely cut glass on plain samples. Pyramid Visual Art Coordinator Diana Amato says the students are loving the class. We’re looking forward to seeing their finished products ourselves!